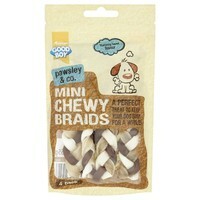 Good Boy Pawsley & Co Mini Chewy Braids are delicious long-lasting hide treats for small and medium breed dogs over 4 months of age. Made with only natural ingredients and beef flavourings to make your dog’s mouth water, Good Boy Pawsley Mini Braids contain only 2% fat and have been enriched with vitamins that help to promote overall health and wellbeing in your dog. Good Boy Pawsley Mini Braids also have a delightful chewy texture that will not only provide your dog with stimulation, but will more importantly reduce the risk of gum disease and tooth loss.